Create a cloud-based, continuous integration and deployment toolchain for distributed .NET development teams, using GitHub, AppVeyor, and Microsoft Azure. Whether you are part of a large enterprise development environment, or a member of a small start-up, you are likely working with remote team members. You may be remote, yourself. Developers, testers, web designers, and other team members, commonly work remotely on software projects. Distributed teams, comprised of full-time staff, contractors, and third-party vendors, often work in different buildings, different cities, and even different countries. If software is no longer strictly developed in-house, why should our software development and integration tools be located in-house? We live in a quickly evolving world of Saas, PaaS, and IaaS. Popular SaaS development tools include Visual Studio Online, GitHub, BitBucket, Travis-CI, AppVeyor, CloudBees, JIRA, AWS, Microsoft Azure, Nodejitsu, and Heroku, to name just a few. With all these ‘cord-cutting’ tools, there is no longer a need for distributed development teams to be tethered to on-premise tooling, via VPN tunnels and Remote Desktop Connections. There are many combinations of hosted software development and integration tools available, depending on your technology stack, team size, and budget. 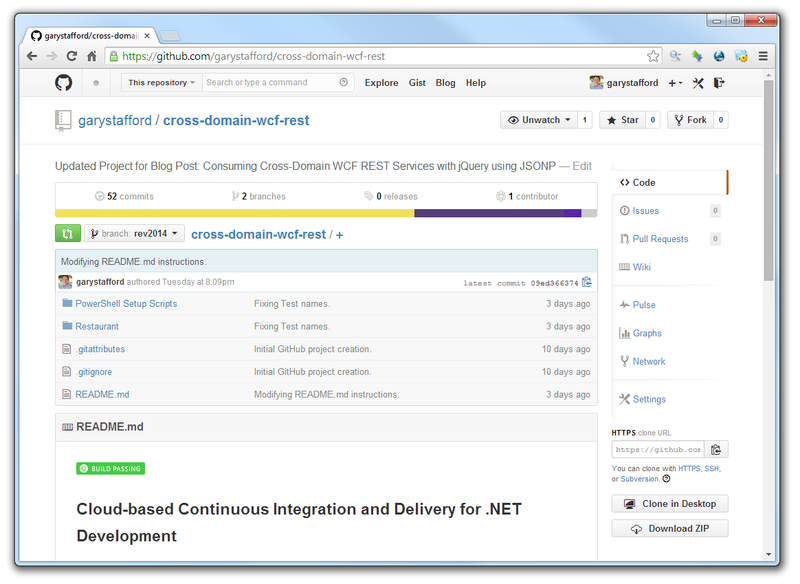 In this post, we will explore one such toolchain for .NET development. 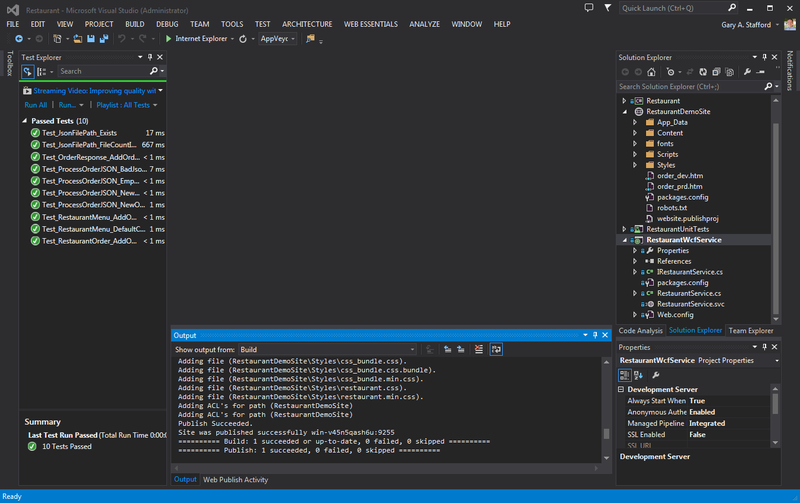 Using Git, GitHub, AppVeyor, and Microsoft Azure, we will continuously build, test, and deploy a multi-tier .NET solution, without ever leaving Visual Studio. This particular toolchain has strong integration between tools, and will scale to fit most development teams. Git and GitHub are widely used in development today. Visual Studio 2013 has fully-integrated Git support and Visual Studio 2012 has supported Git via a plug-in since early last year. Git is fully compatible with Windows. Additionally, there are several third party tools available to manage Git and GitHub repositories on Windows. These include Git Bash (my favorite), Git GUI, and GitHub for Windows. GitHub acts as a replacement for your in-house Git server. Developers commit code to their individual local Git project repositories. They then push, pull, and merge code to and from a hosted GitHub repository. For security, GitHub requires a registered username and password to push code. Data transfer between the local Git repository and GitHub is done using HTTPS with SSL certificates or SSH with public-key encryption. GitHub also offers two-factor authentication (2FA). Additionally, for those companies concerned about privacy and added security, GitHub offers private repositories. These plans range in price from $25 to $200 per month, currently. AppVeyor’s tagline is ‘Continuous Integration for busy developers’. AppVeyor automates building, testing and deployment of .NET applications. AppVeyor is similar to Jenkins and Hudson in terms of basic functionality, except AppVeyor is only provided as a SaaS. There are several hosted solutions in the continuous integration and delivery space similar to AppVeyor. They include CloudBees (hosted-Jenkins) and Travis-CI. While CloudBees and Travis CI works with several technology stacks, AppVeyor focuses specifically on .NET. Its closest competitor may be Microsoft’s new Visual Studio Online. Identical to GitHub, AppVeyor also offers private repositories (spaces for building and testing code). Prices for private repositories currently range from $39 to $319 per month. Private repositories offer both added security and support. AppVeyor integrates nicely with several cloud-based code repositories, including GitHub, BitBucket, Visual Studio Online, and Fog Creek’s Kiln. This post demonstrates continuous deployment from AppVeyor to a Microsoft Server 2012-based Azure VM. The VM has IIS 8.5, Web Deploy 3.5, IIS Web Management Service (WMSVC), and other components and configuration necessary to host the post’s sample Solution. AppVeyor would work just as well with Azure’s other hosting options, as well as other cloud-based hosting providers, such as AWS or Rackspace, which also supports the .NET stack. The Visual Studio Solution used for this post was originally developed as part of an earlier post, Consuming Cross-Domain WCF REST Services with jQuery using JSONP. The original Solution, from 2011, demonstrated jQuery’s AJAX capabilities to communicate with a RESTful WCF service, cross-domains, using JSONP. I have since updated and modernized the Solution for this post. The revised Solution is on a new branch (‘rev2014’) on GitHub. Major changes to the Solution include an upgrade from VS2010 to VS2013, the use of Git DVCS, NuGet package management, Web Publish Profiles, Web Essentials for bundling JS and CSS, Twitter Bootstrap, unit testing, and a lot of code refactoring. The Visual Studio Solution Explorer tab, here, shows all projects contained in the Solution, and the primary files and directories they contain. As explained in the earlier post, the ‘RestaurantDemoSite’ web site makes calls to the ‘RestaurantWcfService’ WCF service. 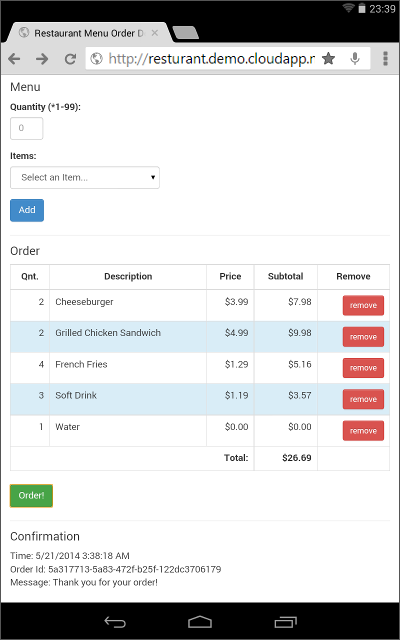 The WCF service exposes two operations, one that returns the menu (‘GetCurrentMenu’), and the other that accepts an order (‘SendOrder’). For simplicity, orders are stored in the files system as JSON files. No database is required for the Solution. All business logic is contained in the ‘Restaurant’ class library, which is referenced by the WCF service. 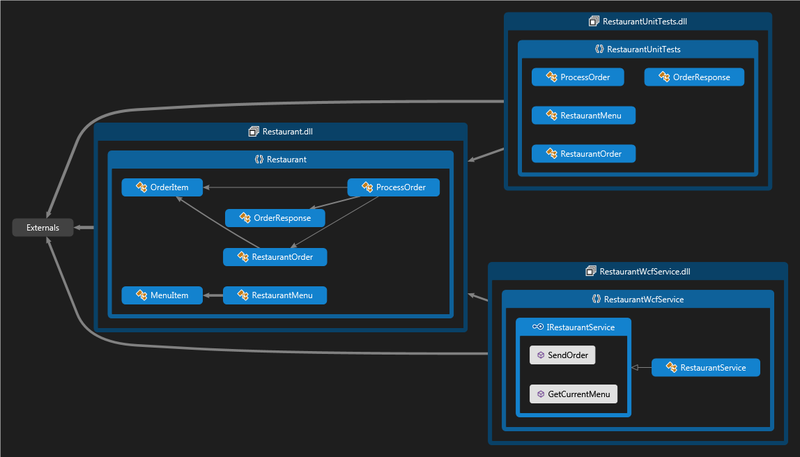 This architecture is illustrated in this Visual Studio Assembly Dependencies Diagram. The README.md file in the GitHub repository contains instructions for installing and configuring this Solution. In addition, a set of PowerShell scripts, part of the Solution’s repository, makes the installation and configuration process, quick and easy. The scripts handle creating the necessary file directories and environment variables, setting file access permissions, and configuring IIS websites. Make sure to change the values of the environment variables before running the script. For reference, below are the contents of several of the supplied scripts. You should use the supplied scripts. The first point of integration in our hosted toolchain is between GitHub and AppVeyor. In order for AppVeyor to work with GitHub, we use a Webhook. Webhooks are widely used to communicate events between systems, over HTTP. According to GitHub, ‘every GitHub repository has the option to communicate with a web server whenever the repository is pushed to. These webhooks can be used to update an external issue tracker, trigger CI builds, update a backup mirror, or even deploy to your production server.‘ Basically, we give GitHub permission to tell AppVeyor every time code is pushed to the GitHub. GitHub sends a HTTP POST to a specific URL, provided by AppVeyor. AppVeyor responds to the POST by cloning the GitHub repository, and building, testing, and deploying the Projects. 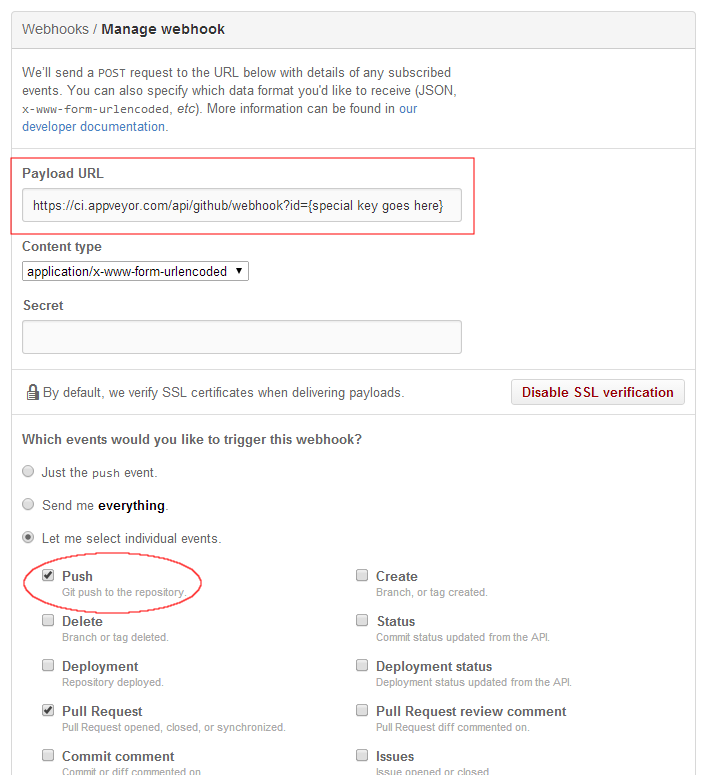 Below is an example of a webhook for AppVeyor, in GitHub. 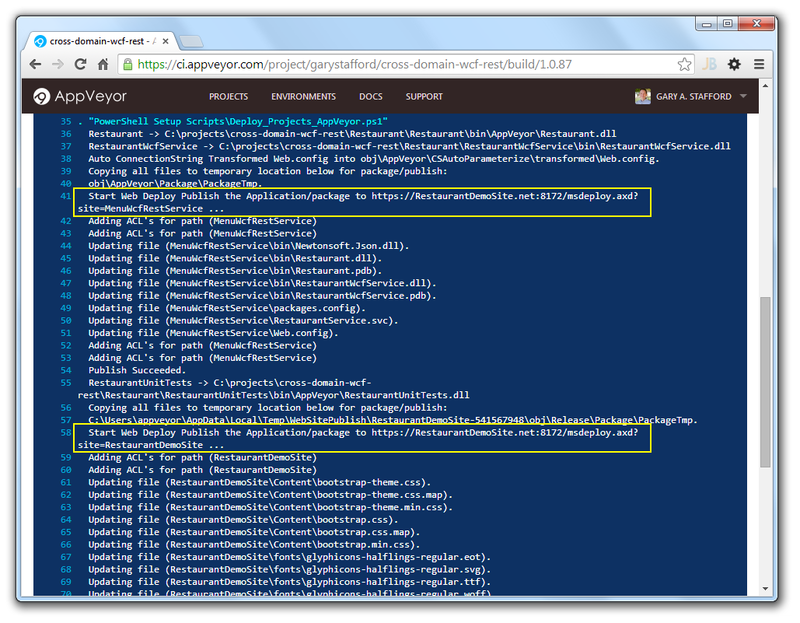 AppVeyor runs the Solution’s automated unit tests using VSTest.Console.exe. VSTest.Console calls the unit test Project’s assembly (‘restaurantunittests.dll’). As shown below, the VSTest command (in light blue) runs all tests, and then displays individual test results, a results summary, and the total test execution time. VSTest.Console has several command line options similar to MSBuild. They can be adjusted to output various levels of feedback on test results. For larger projects, you can selectively choose which pre-defined test sets to run. Test sets needs are set-up in Solution, in advance. 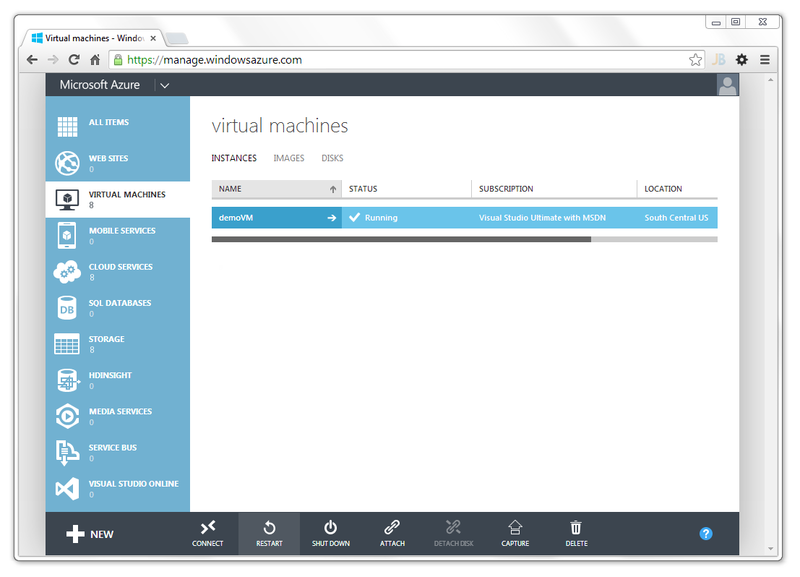 Before we publish the Solution from AppVeyor to the Azure, we need to configure the VM. Again, we can use PowerShell to script most of the configuration. Most scripts are the same ones we used to configure our local environment. The README.md file in the GitHub repository contains instructions. The scripts handle creating the necessary file directories, setting file access permissions, configuring the IIS websites, creating the Web Deploy User account, and assigning it in IIS. For reference, below are the contents of several of the supplied scripts. You should use the supplied scripts. [string]$password = "USER_PASSWORD_HERE" # pa$$w0RD! The second point of integration in our toolchain is between AppVeyor and the Azure VM. We will be using Microsoft’s Web Deploy to deploy our Solution from AppVeyor to Azure. 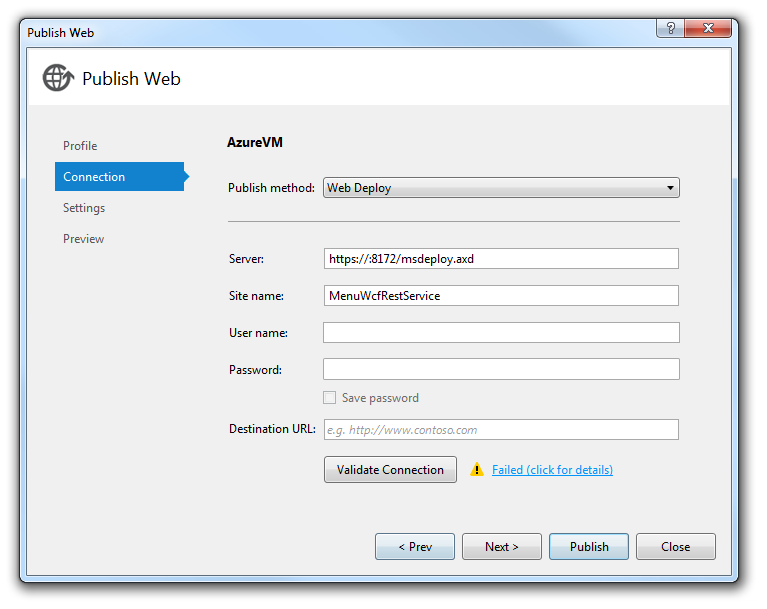 Web Deploy integrates with the IIS Web Management Service (WMSVC) for remote deployment by non-administrators. I have already configured Web Deploy and created a non-administrative user on the Azure VM. This user’s credentials will be used for deployments. These are the credentials in the username and password environment variables we created. 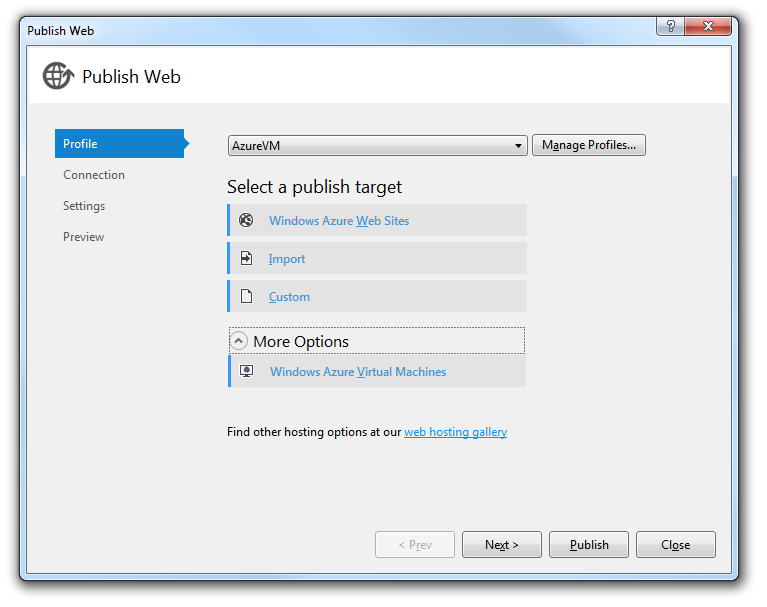 To continuously deploy to Azure, we will use Web Publish Profiles with Microsoft’s Web Deploy technology. Both the website and WCF service projects contain individual profiles for local development (‘LocalMachine’), as well as deployment to Azure (‘AzureVM’). The ‘AzureVM’ profiles contain all the configuration information AppVeyor needs to connect to the Azure VM and deploy the website and WCF service. The easiest way to create a profile is by right-clicking on the project and selecting the ‘Publish…’ and ‘Publish Web Site’ menu items. Using the Publish Web wizard, you can quickly build and validate a profile. Each profile in the above Profile drop-down, represents a ‘.pubxml’ file. The Publish Web wizard is merely a visual interface to many of the basic configurable options found in the Publish Profile’s ‘.pubxml’ file. The .pubxml profile files can be found in the Project Explorer. For the website, profiles are in the ‘App_Data’ directory (i.e. ‘Restaurant\RestaurantDemoSite\App_Data\PublishProfiles\AzureVM.pubxml’). For the WCF service, profiles are in the ‘Properties’ directory (i.e. ‘Restaurant\RestaurantWcfService\Properties\PublishProfiles\AzureVM.pubxml’). As an example, below are the contents of the ‘LocalMachine’ profile for the WCF service (‘LocalMachine.pubxml’). This is about as simple as a profile gets. Note since we are deploying locally, the profile is configured to open the main page of the website in a browser, after deployment; a helpful time-saver during development. This file is used by the publish/package process of your Web project. You can customize the behavior of this process by editing this MSBuild file. In order to learn more about this please visit http://go.microsoft.com/fwlink/?LinkID=208121. A key change we will make is to use environment variables in place of sensitive configuration values in the ‘AzureVM’ Publish Profiles. The Web Publish wizard does not allow this change. To do this, we must edit the ‘AzureVM.pubxml’ file for both the website and the WCF service. We will replace the hostname of the server where we will deploy the projects with a variable (i.e. AZURE_VM_HOSTNAME = ‘MyAzurePublicServer.net’). We will also replace the username and password used to access the deployment destination. This way, someone accessing the Solution’s source code, won’t be able to obtain any sensitive information, which would give them the ability to hack your site. Note the use of the ‘AZURE_VM_HOSTNAME’ and ‘AZURE_VM_USERNAME’ environment variables, show below. We can use the command line or PowerShell to deploy with the ‘AzureVM’ profiles. AppVeyor accepts both command line input, as well as PowerShell for most tasks. All examples in this post and in the GitHub repository use PowerShell. To build and deploy (publish) to Azure from the command line or PowerShell, we will use MSBuild. Below are the MSBuild commands used by AppVeyor to build our Solution, and then deploy our Solution to Azure. 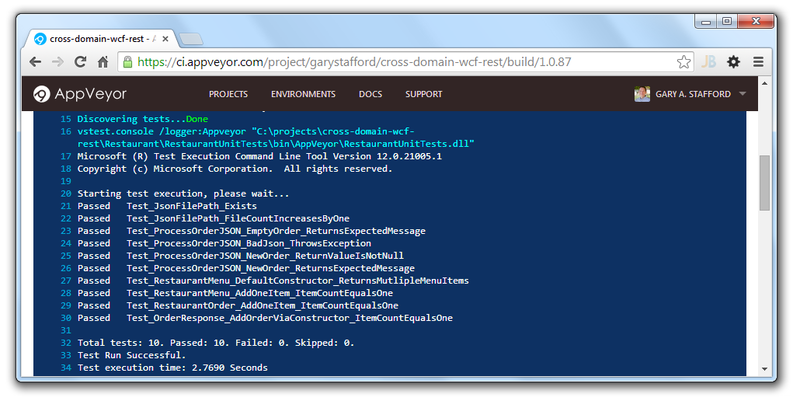 The first two MSBuild commands build the WCF service and the website. The second two deploy them to Azure. There are several ways you could construct these commands to successfully build and deploy this Solution. I found these commands to be the most succinct. I have split the build and the deploy functions so that the AppVeyor can run the automated unit tests, in between. If the tests don’t pass, we don’t want to deploy the code. Write-Host "*** Solution builds complete." Write-Host "*** Solution deployments complete." 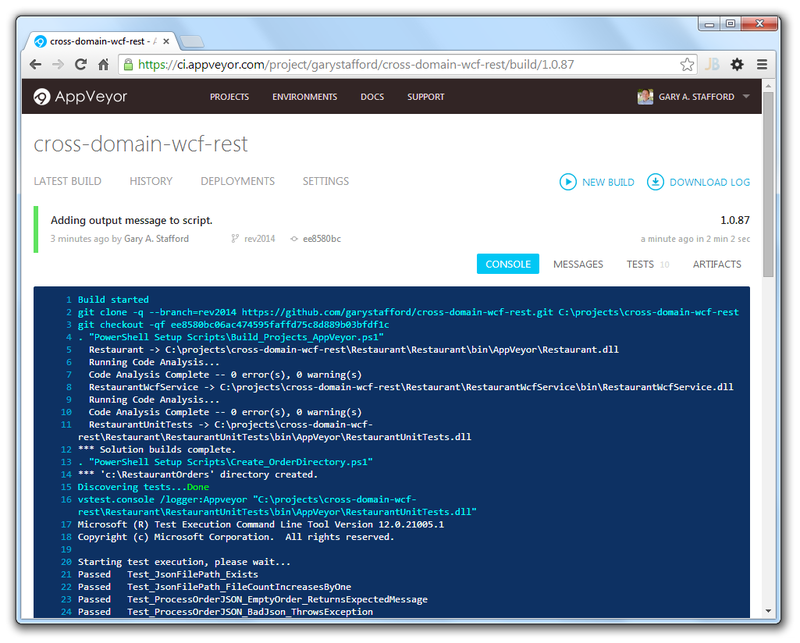 Below is the output from AppVeyor showing the WCF Service and website’s deployment to Azure. Deployment is the last step in the continuous delivery process. At this point, the Solution was already built and the automated unit tests completed, successfully. AppVeyor Output from Deployments to Azure. Below is the final view of the sample Solution’s WCF service and web site deployed to IIS 8.5 on the Azure VM.